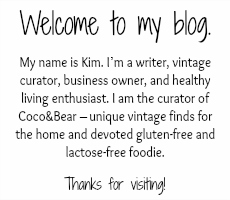 Coco&Bear: Dairy-Free & Gluten-Free Mini Donuts! 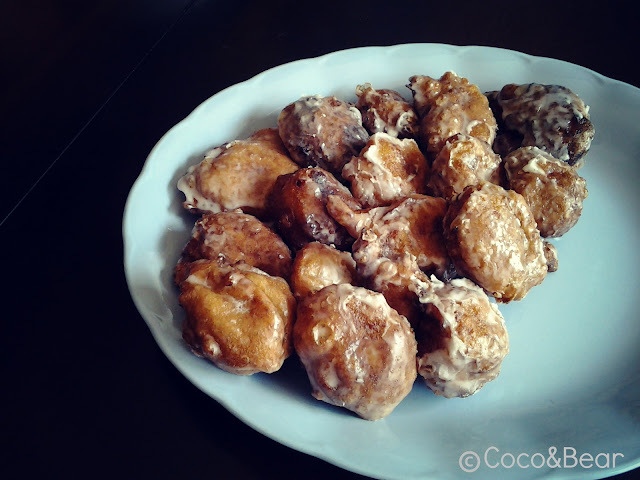 Dairy-Free & Gluten-Free Mini Donuts! I found this recipe a few months back when I was desperately seeking something sweet to eat. Being dairy and gluten-free definitely has its challenges, especially when you have a sweet tooth. I stumbled across this recipe on Pinterest and thought I would give it a try one night. These delicious little bundles of joy were so easy to make and were so tasty that I had to make them the following week for my monthly girls night. I figured they would be honest and tell me if these were just another yucky gluten-free recipe that I was trying to pass off as being good. (I do that a lot) I was so happy when they all said they liked them! Now, let's be honest - they won't pass for a Tim Hortons timbit or anything but, for what they are, I thought they were pretty tasty! These are definitely worth a try! Combine water, butter, and stevia (or sugar) in a saucepan. Bring to a boil, stir to combine. When butter is dissolved, add the flours and baking soda. Stir it all together to bring it into a ball. Turn off the heat and allow the dough ball to sit for 5 minutes to cool slightly. Add eggs one at a time to the dough ball and stir to combine completely before adding the next egg. Pour cooking oil into a pan. Make sure you add enough oil so that when you drop your mini donuts into the oil, it will cover them. Heat the oil to 375 degrees. I used a small spoon to make these. You will scoop about 2 tbsp of dough into the oil. Do this in batches, but don't overcrowd the pot. Turn the donuts over when they begin to brown. Keep the moving until they appear crispy on the outside. Remove and place on a paper towel to soak up the oil. Leave them to cool slightly. Continue until you've used up all of your batter. While the donuts are cooling, combine the powder sugar with the water - but only add one tbsp of water at a time and stir. You want the glaze to be thick so it will stick to the donuts. When ready, dip the donuts into the glaze and let them sit to cool completely. Then... enjoy! Tip 1: After making these the first time, I decided to add some cinnamon to the mixture. This gave them a little more sweetness which I loved. The next time I make these, I was going to try adding raisins as well. Heck - you could even coat these in chocolate! Tip 2: If you are at all like me and have no real experience frying donuts, my tip would be to leave them in just a little bit longer than you think they should stay in. I really didn't know how long they would need. At first, I would remove one and open it to see if it was cooked enough. Trial and error - you'll figure it out! I have to give credit to the original author of this recipe! Check out the Non-Dairy Queen for this and other excellent recipes! This looks so good! I will have to try it some time soon! Thank u! I did love them!